The Recompose tool in Photoshop Elements is like a super-intelligent crop-and-transform tool. You can move elements in an image closer together or change the orientation of a landscape shot from horizontal to vertical without sacrificing your most vital content. In the Editor, in Edit Full mode, select the Recompose tool from the Tools panel. This tool shares the same flyout menu with the Crop tool. You can also press the C key. Press Shift+C if the Crop tool is visible. When you select the tool, you’re presented with a dialog box describing what the tool does and also giving you the option of viewing an online video tutorial. Click OK.
(Optional) Using the Brushes and Erasers in the Options bar, mark the areas you want to protect and eliminate. Mark for Protection Brush: Brush over the areas of the image you want to protect or retain. (Strokes will be green.) You don’t have to be super precise; just give Elements an inkling of what you want to keep (or remove, in the case of the next brush). Mark areas that you want to retain or remove. Mark for Removal Brush: Brush over those areas you want to remove first. (Strokes will be red.) Make sure to choose the area you don’t mind eliminating at all. Erase Highlight Marked for Protection: Use this tool to erase any area you erroneously marked to retain. Erase Highlights Marked for Removal: Use this tool to erase any area you erroneously marked to remove. Specify the other options on the Options bar. Brush Size: Click the down-pointing arrow and drag the slider to make the brush diameter smaller or larger. Highlight Skin Tones: Select this option to prevent skin tones from being distorted when scaled. Presets: Use a preset ratio or size to which to recompose your image. Or leave on the default of No Restriction. Width and Height: Enter width and height scale percentages if desired. Amount: Set a recomposition threshold to help minimize distortion. Start with a higher percentage, and then adjust as needed. Grab an image handle and resize your image. As you drag, the red areas are removed first, and the green areas remain intact. After all the red areas have been removed, Elements begins to “carve” out areas you didn’t mark to protect. 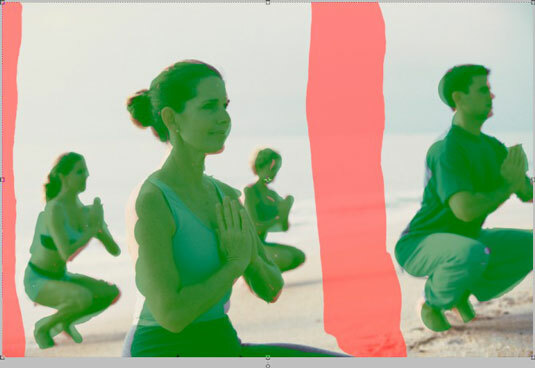 After you’ve recomposed your image as desired, click the Commit (green) check mark icon to accept the composition. Retouch any areas as needed with the Clone Stamp or Healing tools. For the example in the following figure, noticeable seams near the man’s feet and some of the sandy areas were cloned.